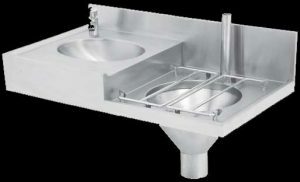 Franke model CHBC Slop Hopper Wash hand basin combo unit 965 x 550 mm manufacture from grade 304 (18/10) stainless steel 1,2 mm thick with a 100 mm high integral splash back to the rear and both sides. The cone has an integral flushing rim and a 110 mm waste outlet for pan connector, the inlet is fitted with a 38 x 250 mm long vertical flush pipe for a standard flush valve. Unit fitted with a hinged bucket grid manufactured from 10 mm diameter grade 304 (18/10) stainless steel round bar. 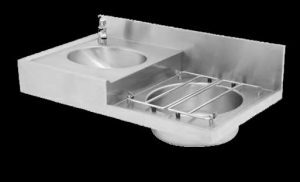 Wash hand basin size 360 x 280 x 140 mm deep with a 40 mm waste outlet is included on the left or right hand side (please specify). Unit complete with two 40 x 40 mm square stainless steel wall mounting gallows brackets. Unit fixed to wall 850 mm from the top of the front apron to the finish floor level with 4 off anchor bolts (bolts specified elsewhere). Walcro 104T with isolating valve, 38 mm water supply flush valve flush pipe connected to CP on brass adapter (Walcro fittings not included in units). Slop Hopper can be adapted to flush using an 11 liters high level cistern (Supplied as an optional extra). 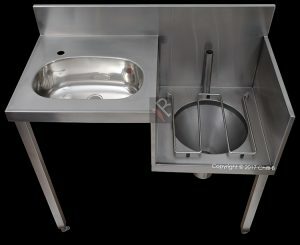 Pressed wash hand basin integrated into a stepped work top for maximum hygiene. 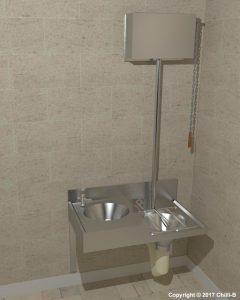 Various types of taps can be installed on the basin. The most popular ones are metered pillar taps to save water. Slop hopper to the right with a high level stainless steel cistern installed. high pressure flush valve such as the WC-106T or WC104T can also be used if municipal water pressure is available. 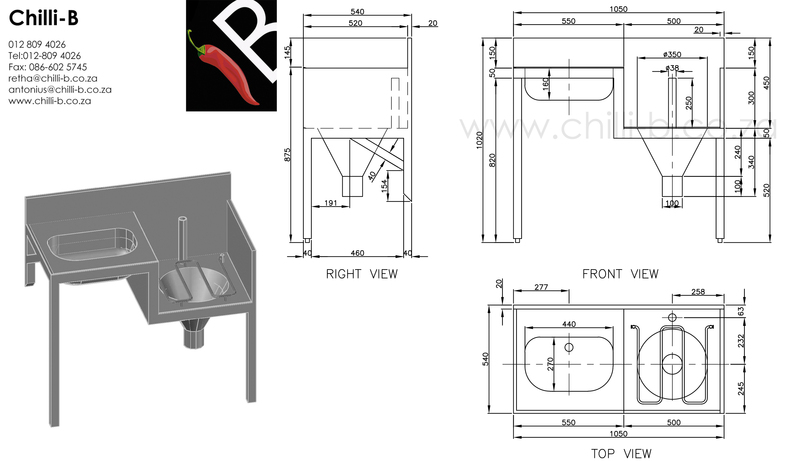 The Model CHBC is a compact slop hopper with small basin. There is space for one or two pillar taps. 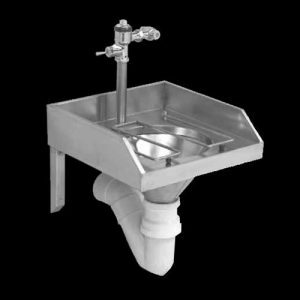 The basin is close enough to the back for a wall mounted mixer, however a swivel spout is not recommended as the water might splash on the work surface. 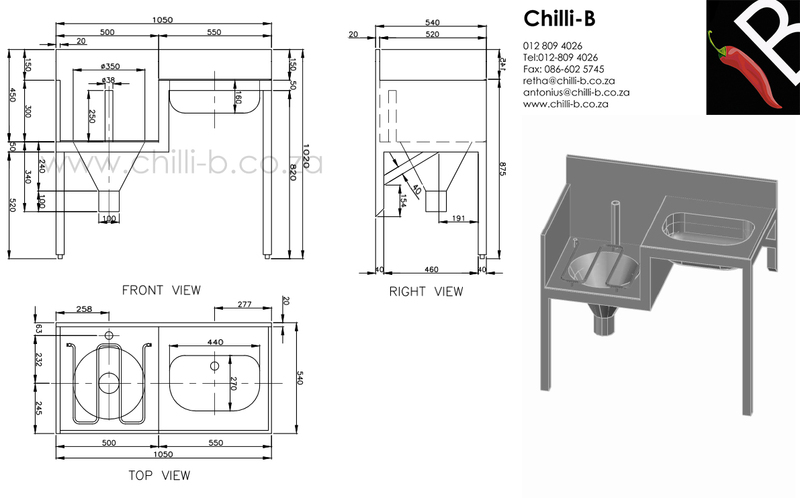 the model SHBC is a new design with large deep bowl basin suitable for pillar taps or kitchen sink mixers. The basin is too far from the back for wall mounted taps. The slop hopper section is lowered for easier access than the CHBC. Extra hygiene is achieved with higher splashbacks to the back and additional splashback on the side of the slop hopper so that the wall or floor next to the hopper does not get dirty. 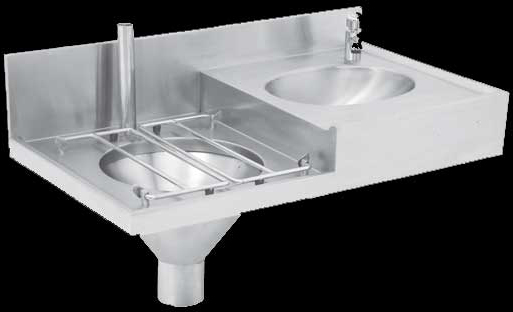 The Slop hopper basin combo on one level is used in hospitals, clinics, laboratories and processing factories. 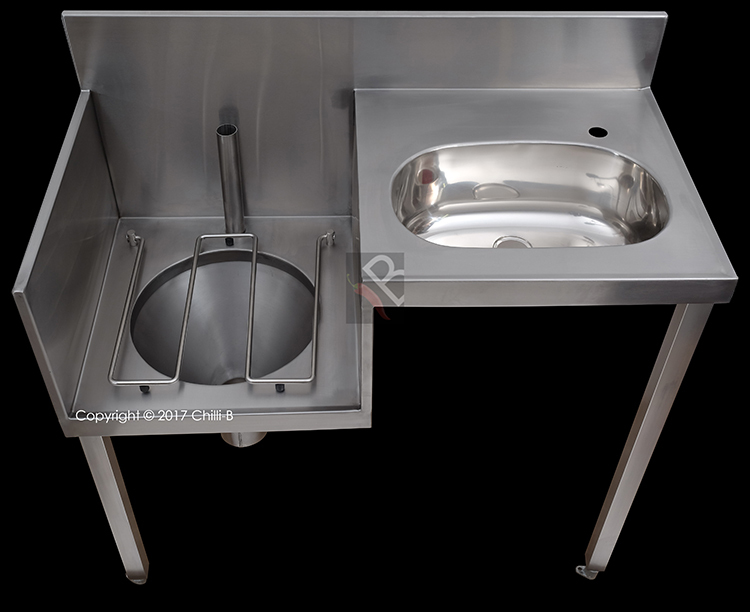 It comes standard with a large sink 490 x 400 x 190 mm. However this bowl can be customized to customer needs. The slop hopper can be placed either to the right or to the left. Model shown is with a WC-106T flush valve but a high level cistern can also be used if water pressure and flow is a problem.